Over half of the US adult population takes a dietary supplement, according to 2003-2006 statistics from the Centers for Disease Control. Multivitamins and multi-minerals are the leading dietary supplement. Dietary supplements and vitamins are a yearly multi-billion dollar business. While many supplements do improve the health of users, other supplements have dangerous side effects, can cause permanent harm, and, in some cases, wrongful death. There are too many stories about retail stores such as Wal-Mart and Walgreens selling supplements that did not match the representations on the label. Paulson & Nace, PLLC, a family-owned and operated West Virginia law firm, knows how dangerous health supplements can be and what laws apply to false labeling and false advertising of dietary supplements. We know that the Federal Drug Administration (FDA) is the leading regulator of dietary supplements. The Dietary Supplemental Health and Education Act (DSHEA) and Federal Food, Drug, and Cosmetic Act (FFDCA) are two of the laws that govern dietary supplements. According to the U.S. Congress, dietary supplements are classified as a food and not a drug. A dietary supplement is a product that is ingested through the mouth and contains an ingredient that is supposed to aid in a person’s diet or nutrition. Ingredients include vitamins, minerals, herbs, concentrates, or other matters. All dietary supplements must be properly labeled. The advertising must indicate that the supplement is not to be the sole source of nutrition for a meal. Dietary supplements that meet the legal definition do not need approval by the FDA. The FDA, though, may have regulatory authority if the merchant, distributor, or manufacturer makes claims about improving diseases. Retailers and manufacturers who claim that its supplement helps with diseases such as heart disease or cancer can be held liable for false claims. Regulation of dietary supplements includes rules about the product itself and rules about how the product is marketed or labeled. The FDA has recalled many dietary supplements because they pose a danger to the public. Dietary supplements and vitamins can cause personal injury. Supplements often do not contain the nutrients that are advertised or achieve the health claims that are claimed, such as helping with weight loss. In some cases, the Federal Trade Commission may also have a say over whether the advertising is false or inaccurate. The DSHEA requires that manufacturers of dietary supplements bear the burden of making sure their products are safe for the consumer. The DSHEA also requires that claims about the merits of the dietary supplement be supported by actual evidence. The West Virginia law firm of Paulson & Nace brings consumer actions and personal injury actions for consumers who are misled or injured by dietary supplements that do not work as advertised. Our lawyers hold these suppliers and supplement makers accountable for violations of federal and state consumer laws and product liability laws. Consumers who purchase a dietary supplement or vitamin should be careful before they ingest the product. If the product does not do what is claimed, you may have a claim for financial damages. If the product causes physical harm, you may have a personal injury claim. 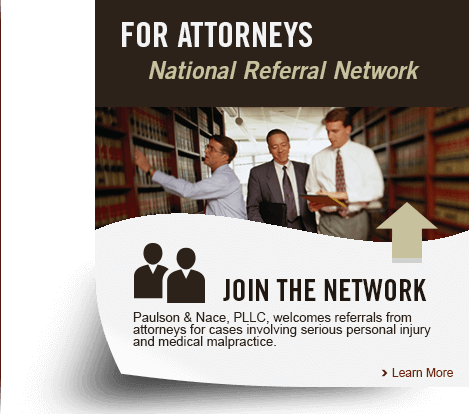 For information on your rights, call the Paulson & Nace, PLLC, family of lawyers today. We can be reached at our West Virginia office at 304-741-8079 or complete our contact form. We fight for consumer rights. Our office is located at 3501 Maccorkle Ave SE, Charleston, WV 25304.